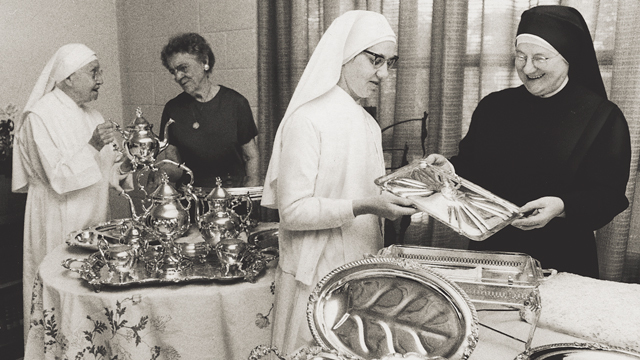 From left, Sister Louise, Mrs. Marie Hardy, Sister Ita Mary, and Sister Marcelle looking over silver service donations received by The Little Sisters of the Poor. The sisters conducted a silver collection to raise money for the new home on Michael Road that would serve the indigent elderly in Richmond. In 1874, an international order of Roman Catholic nuns came to Richmond. Founded in 1839 by a French woman who welcomed a blind, starving wanderer into her home, the Little Sisters of the Poor were dedicated to serving the indigent elderly throughout the world. Within two years of arriving in Richmond, the local order moved into an estate in the Fan called Warsaw, located at Main and Harvie Streets. There, they established a home for the aged called St. Sophia’s and begged in the streets every day – one of the requirements of their vows of poverty – to fund its mission of service. The sisters remained at Warsaw for over a century, until it was condemned in the 1970s. Unable to afford its repair, the nuns were allowed to keep St. Sophia’s open with a provisional license until they could secure a new facility. Using generous donations to purchase land, they were able to build a new home for the aged on Michael Road in western Henrico, where they still serve the indigent elderly today. What became of St. Sophia’s? The dilapidated old building in the Fan was converted into luxury condos. 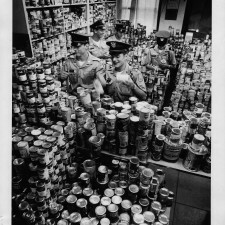 From food drives to fundraisers – like the silver collection the sisters conducted to raise money for the new home in 1972 and food drives organized by St. Benedictine cadets to feed its residents in 1977 – the sisters have relied on the charity of Richmonders for nearly 150 years. 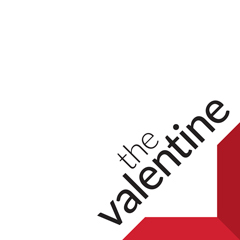 In recent years, you may have heard them solicit donations from your local church congregation or attended the Little Sisters of the Poor French Food Festival in the spring. Previous articleGuess Who’s Coming with Dinner?